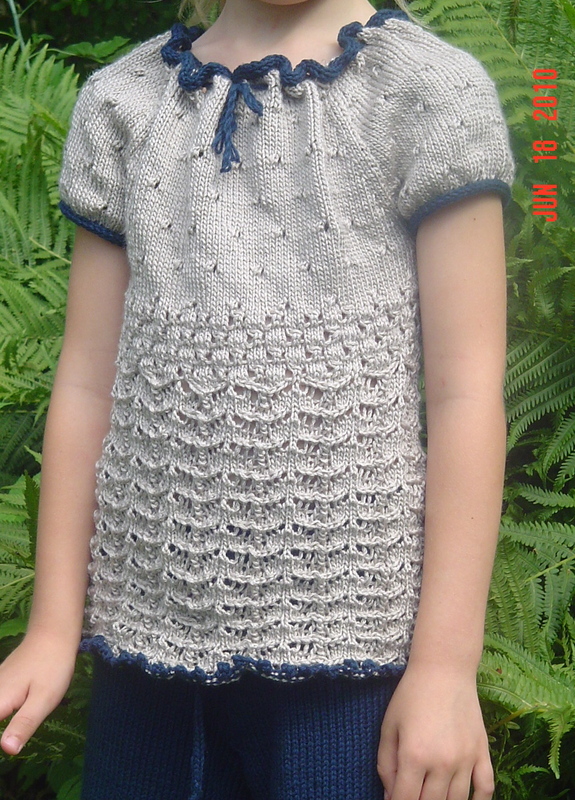 From Victorian Lace Today, using knitpicks Alpaca Cloud. I’ve been having trouble sleeping lately. Usually this is due to stress or anxiety, but this time it is due simply to the weather. We’ve had an unusually large number of storms lately, and even a string of storms where it didn’t stop raining and storming for 30 hours. We have been getting a few overnight and a few during the day every day for a good long while now. The ground is saturated, the rivers are high, and we are hoping to dry out soon. Monday nights storm seemed particularly close, the thunder kept shaking the house, the rain was streaming in, and the lightning was so bright. I had just fallen asleep when it started, and kept trying to get back to sleep. But then I heard someone calling out to my neighbor, over and over. So I had to go have a look at what was going on. I poked my head out the door and during the lightning flashes could see that the tree across the street had split in half and the half that fell had landed on my neighbors car. She and another neighbor were out there talking about it. I decided it was time to get some rest. It was good that I did, since 2 more storms rolled through early that morning and I couldn’t sleep through them either. The next morning I got Bug to get out of bed pretty quickly by telling her that a tree was down on Sandy’s car. She gets pretty excited over any neighborhood anomaly. She immediately ran outside to find Sandy and ask her about it. Unfortunately we could not tell what damage was done to the car as the tree had also brought down a power line, and thus Sandy was waiting on the power company to come out and advise. Bug and I took bets on the way home as to if the tree would be cleaned up or not. I suspected it would not be as there have been many incidents in these storms. But it was, and then I was able to clearly see the tree. 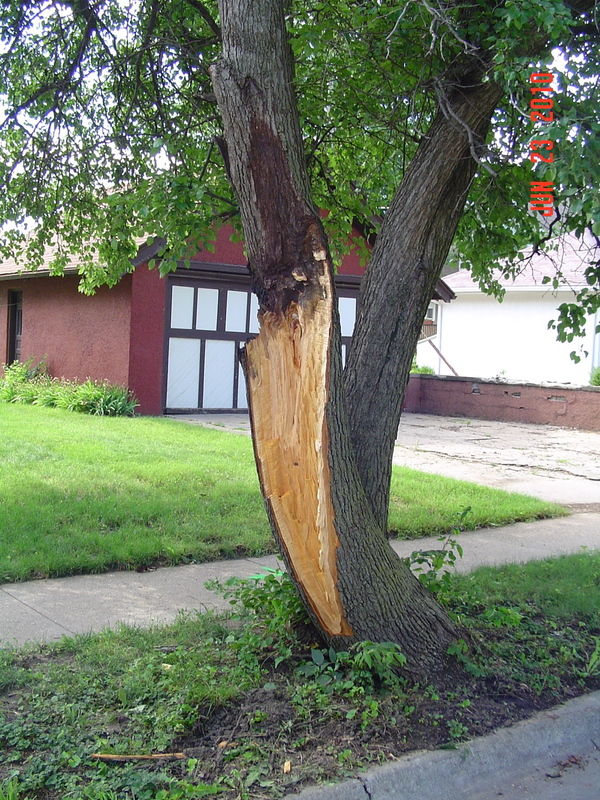 Looks to me like lightning struck it. There are burn marks and discoloration above the split. It seems to have struck right where the tree forked. Looking at it from my porch, it looks quite strange, as it really does look like half a tree in the foliage area. I feel fortunate to have nice mature trees in our area, trees which are higher than the houses. I feel fortunate that lightning didn’t strike the house. It was an exciting evening! We had no storms last night, and so sleeping was much more pleasant. I hope the trend continues for a bit. “What? Why did you cut your own hair?” I asked. “Well, because Gabby has a bag with her hair in it, and I wanted to have a bag with my hair in it too!” She replied. 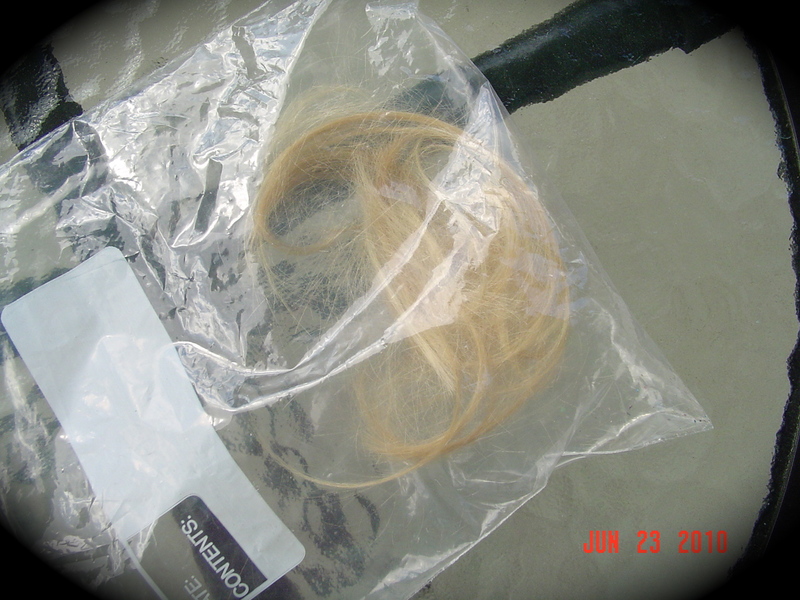 Yep, that is a bag of hair! So I figured no amount of fussing on my part was worth anything, seeing as she’d already done it. 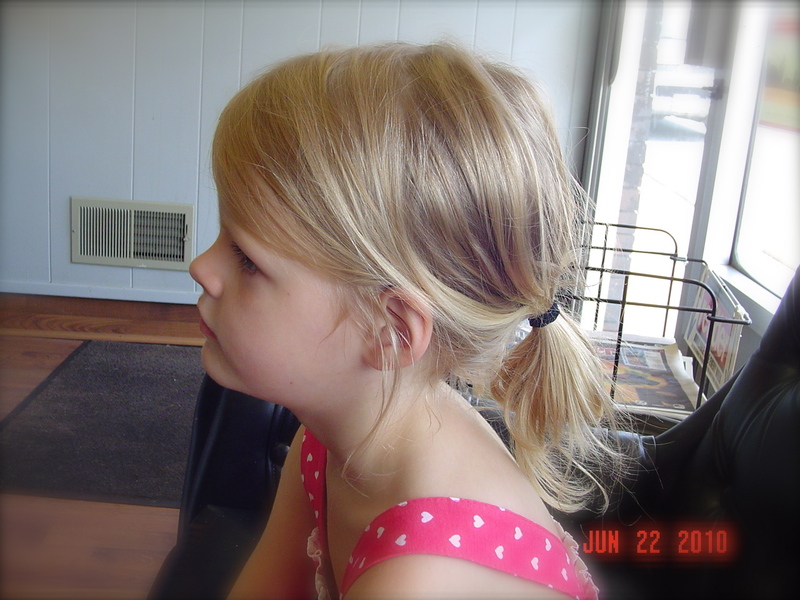 Additionally, I knew she wouldn’t want her hair cut, and now it had to be done. So I explained to her that we were now going to have to cut her hair short, and that is what happens when you try to cut your own hair. So I made the appointment, and Bug took it pretty well. It was very very hot and humid, and so she was almost glad to be getting rid of her hair due to it hanging down her back and making her sweaty. I snapped a picture with it in a ponytail, doubled up, in order to keep her cool. And then she got it all cut off! I was pretty specific about what I wanted. Bug was very pleased because she got hair just like her Nana. 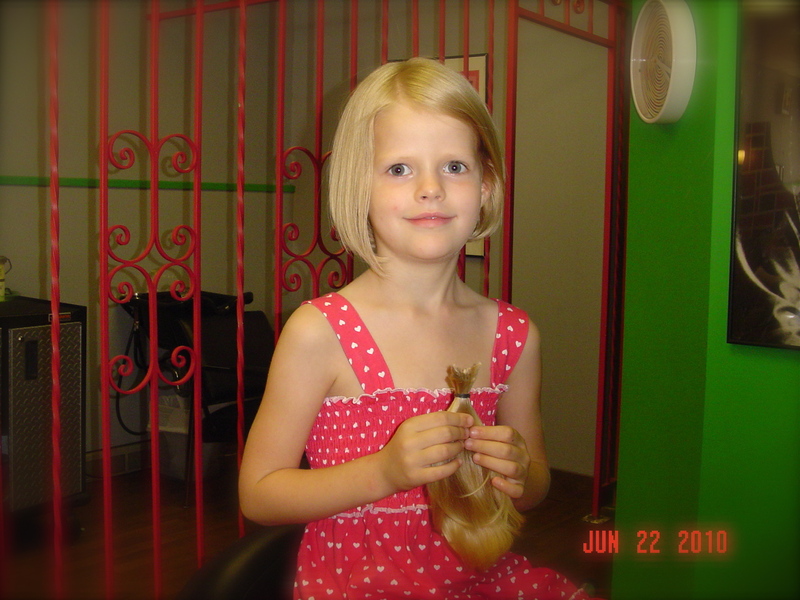 I was pleased because it is cute, trendy, AND she had enough of a ponytail to donate. Were there tears? Yes, in the car on the way home. But they were short lived, and she decided that her hair looked awfully cute with her dress. I figure she is the same sweet girl with or without long hair. And if she wants to grow it out, it will grow. Eunice pattern from Sock Innovations book. 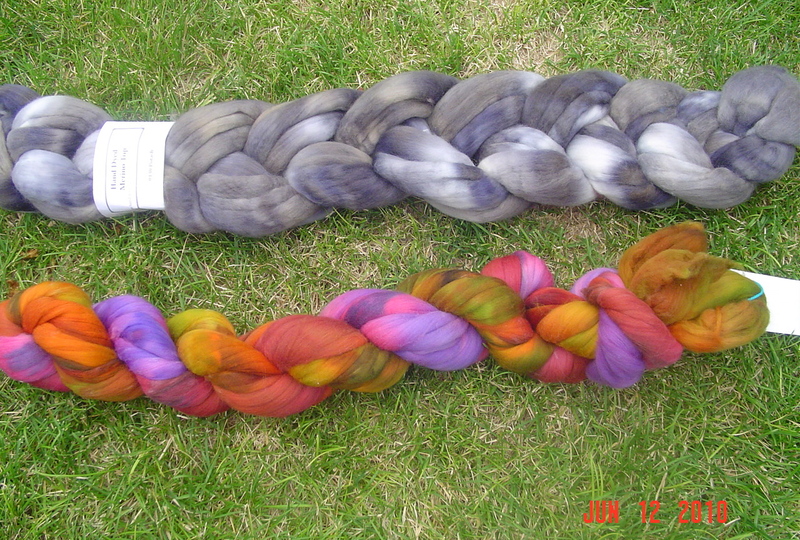 Yarn is Malabrigo sock. I did these for the Round the Twist KAL, and also entered them in Sock Knitters Anonymous for the May challenge. Hence the need to get them done already. I think I am all knit out when it comes to socks. I need a break! 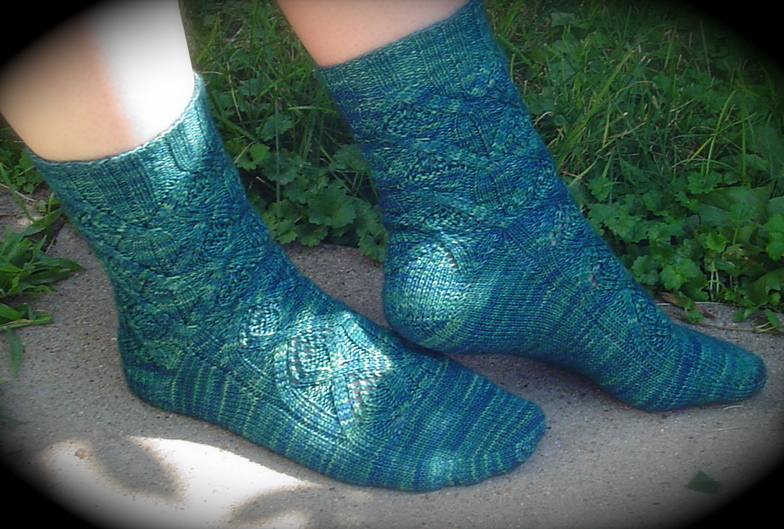 I usually keep a pair of socks at work in order to knit on during my lunch hours, but I think I’ll take some lace in or something instead. The pattern was fun though, and I love the result. Malabrigo sock is a thinner yarn than I had expected, so the pair is a good snug fit. Not snug enough to be uncomfortable, but they certainly won’t be falling down! This is the first time I’ve knit such large cables and had the pair still fit! 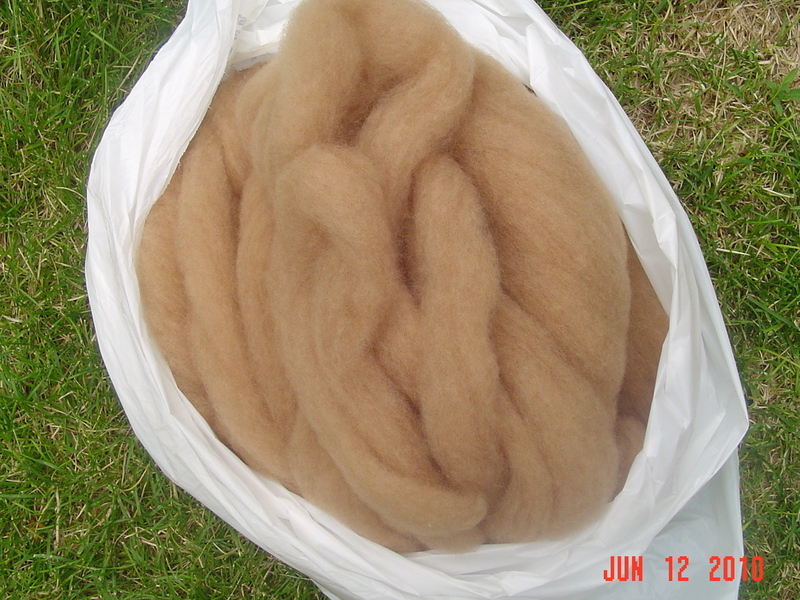 Is the crown mountain farms superwash merino. I am thinking that I’ll be able to finish the final third on Sunday and ply on Tuesday, but it may take longer than that, since there is no rush. 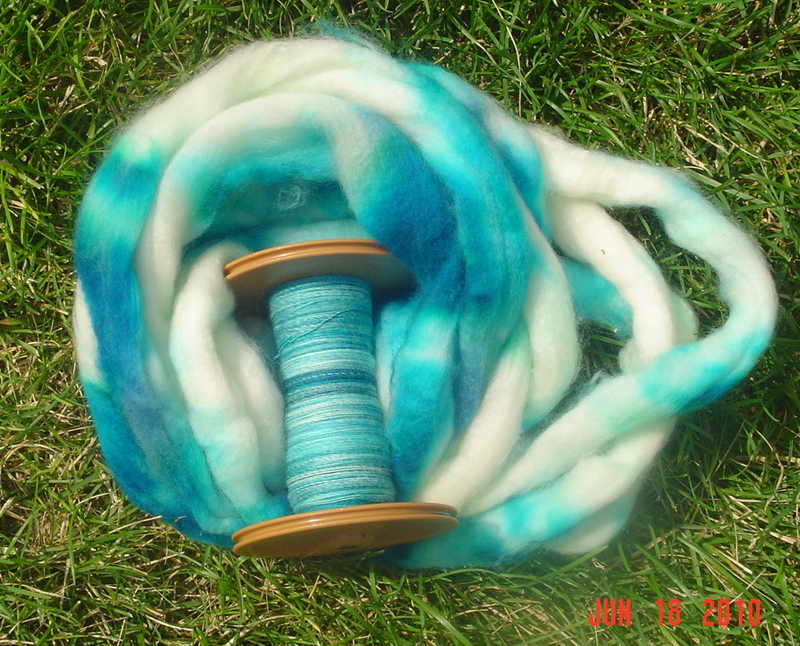 I am enjoying this particular merino, as it is close to a color I dye for myself from time to time. The colorway is blue suede shoes. 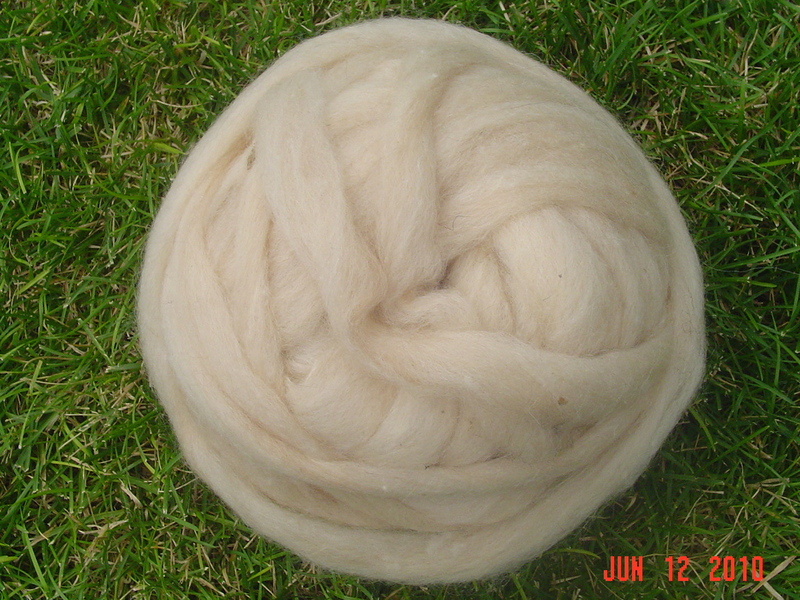 The white space should leave me with a lovely and fairly subtly shaded 3 ply, can’t wait to see it! So, as soon as I finished her unmentionables, I decided I needed a top for Bug as well. I had been itching to knit Ummeyusuf’s design called Raspberry Lemonade for quite some time, but I just hadn’t had the inspiration. Well, with the lacy look of the pants and an appropriate contrast color, I decided it would be a lovely pairing. 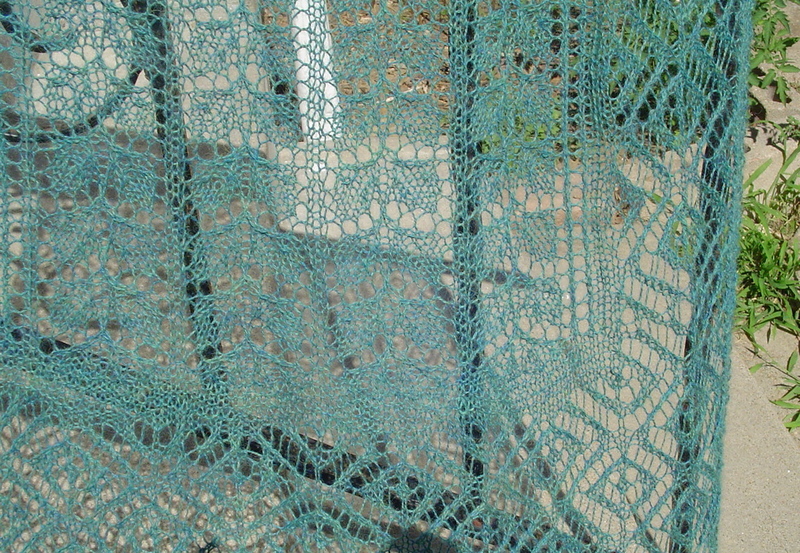 The yarn is caron natural spa, mostly acrylic with some bamboo. Very very splitty but quite soft. I grabbed Bug for a photoshoot this afternoon, even though the weather is too hot and muggy to be wearing anything knit. I have to admit, the ruffled top had me fooled, I really had convinced myself there was no way it was going to work. But….as you can see it ended up looking quite nice! 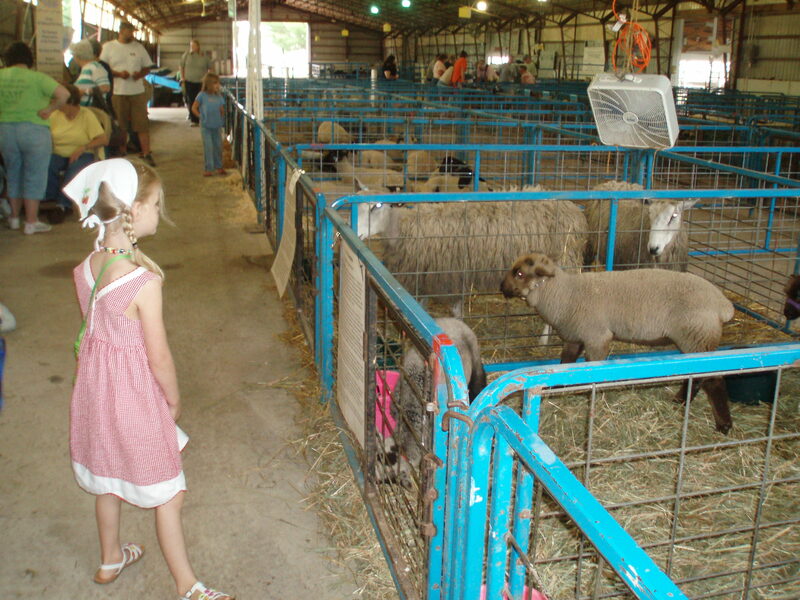 So last Saturday a couple of us wandered off to the Iowa Sheep and Wool Festival. As we left, it was just pouring out and we wondered what the day would bring. But as it was predicted to be hot and muggy, we got all gooped with sunscreen and headed out. It is about a 2 hour drive, and I drove in and out of storms the entire way. Once we got to the festival though, we did not see any more rain. The storms had the added benefit of having kept everything nice and cool, so they day was most pleasant. 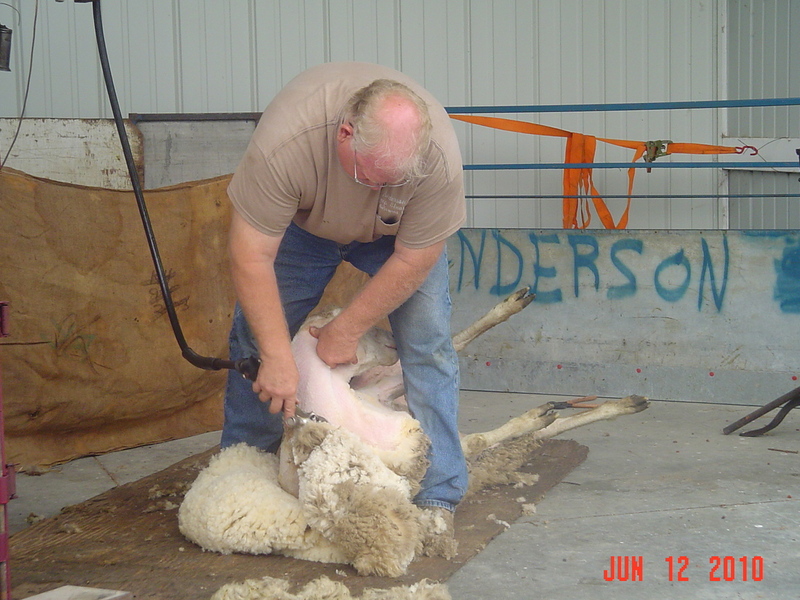 One of the first things we did was go see a sheep shearing demo. I was surprised at just how still and calm the sheep was for this process, though it isn’t a job I’d ever want to do! The demonstrator said that he usually shears about 100 head a day, up to 200 if necessary but that means there is no time for anything else. It is very very dirty, and strengthens my resolve to never purchase a fleece to process by myself. Just not a side of my craft that I am interested in exploring. We spent some time wandering around the hall of breeds, something which Bug rather enjoyed though she mentioned that she was nervous that a goat would try to eat her shoes. Since IA sheep and wool coincided with world wide knit in public day, we grabbed some lunch and sat down to knit. Bug decided to wander off to a friendly tent of vendors called “Mother of Purl.” She’d rather befriended a grandfatherly gentleman there and was curious about some hammers, stones, and letters that were outside the booth. Turns out they were for hammering on metal. They were selling the little metal discs that could be hammered, but Bug managed to get one gratis. She then befriended a young boy and his dad and they helped her create a disc with her name on it. We hung out for quite some time waiting for the kids activities tent, as it had been advertised all over the festival. We were highly disappointed when we realized that not only didn’t they have kids activities, they didn’t even have the tend set up for it. We thought that was a bit of a bum deal. This is actually a richer warmer natural color than the picture shows. And I found some camel for a very cheap price. This camel, it feels soft as butter! I hope it is as easy to spin as the vendor assured me it would be. The final purchase was rather unexpected. I’d visited an alpaca farm booth. There are alpaca farm booths all over, but this one also had some handwoven scarves. I thought they were just stunning. I passed up the scarf on the first round, but still went back. 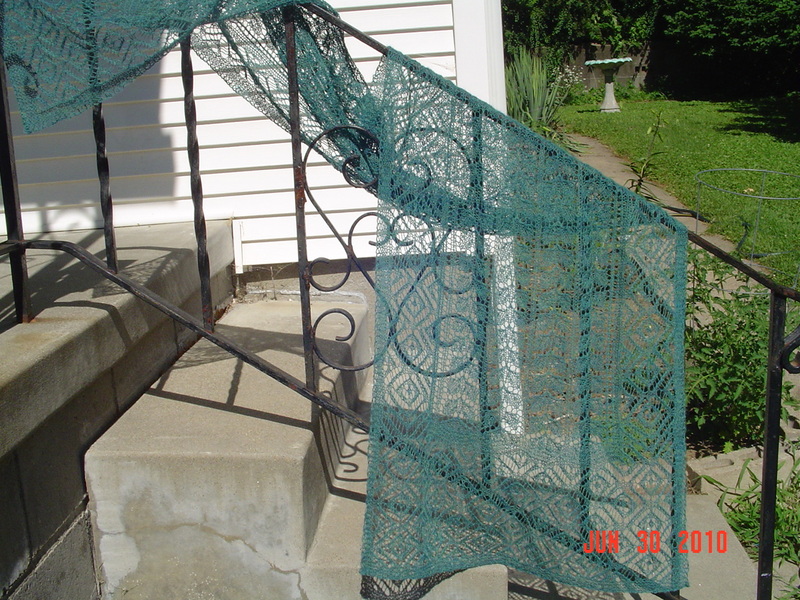 This is why I need to get some weaving lessons! All in all it was a lovely day. I’d say the festival was a bit smaller than expected, but worth the drive this year. I am still annoyed by the lack of kids activities and not knowing they would not be there in advance. I spent the day telling Bug she would get to do them, so disappointing her was very hard. But, we still had a nice time.